The New York rental agreements can be downloaded and are available in pursuant to all State laws (Article 7: Landlord and Tenant) for the leasing of residential and commercial property. Before a contract is signed the tenant will usually view the property and see if it fits their needs, if so, the landlord will usually ask for their credentials under a rental application. After processing the verification, the lessee will be made aware if they were approved and a document will be negotiated, written, and signed. Rental Application – Used by landlords to check the status of a tenant’s credit, background, references, and any other requested information. Apartment Lease Agreement – For a residential unit located in a multi-family. Commercial Office Lease Agreement – Area used for professional work or services. Commercial Retail Lease Agreement – Space located where person-to-person trade occurs such as a store or restaurant. Condominium Lease Agreement – Residence that is owned usually in a property with other individuals sharing common space. Lease Agreement with Option to Purchase – Tenant/Buyer has the right to buy said property on terms agreed upon by the owner/lessor during the course of the occupancy. Month to Month Lease Agreement – Contract pursuant to § 232-b that can be canceled at anytime with notice of at least one (1) month by either party. Real Estate Board of New York Lease Agreement – Fixed term contract provided by the Real Estate Board of New York. Room Rental (Roommate) Agreement – For the parties living in a shared home to explain the rules and fees of each living companion. Standard Residential Lease Agreement – Fixed arrangement that is commonly for a one (1) year term. Sublease Agreement – The act where a person, the ‘original tenant’, decides to allow another person, the ‘sublessee’, to take over their lease for a partial or end of its term. Termination Lease Letter – In accordance with § 232-b, a month to month arrangement may be terminated by serving this notice to either the landlord or tenant with at least one (1) month’s notice. Bed Bugs – In New York City only, landlords are required to acknowledge the existence of bed bugs in the rental unit. 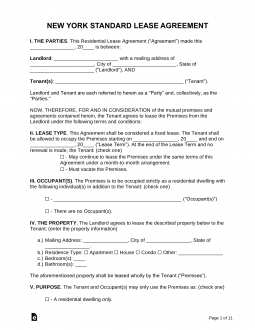 Copy of Signed Lease (Source of law is in Page 4 of the Tenants’ Rights Guide) – The landlord must give a signed copy of their lease within thirty (30) days of tenancy. Lead-Based Paint – Per Federal law requiring all residences built before 1978 for the landlord to issue this notice to inform the tenant of the hazardous paint within the walls and ceiling. Security Deposit Receipt (§ 7-103) – No matter the amount, if a deposit is accepted by the landlord the name and location of the financial institution must be relayed to the tenant in writing. Window Guards – In the City of New York if the tenant has a child that is ten (10) years of age or younger the landlord is required to fit the apartment with window guards. There is no State law that requires the landlord to give any type of notice before entering the tenant’s space for any type of repair or non-emergency issue. Interest (§ 7-103) – If the tenant is living in a building that has at least six (6) residential units then the landlord is required to deposit the Security Deposit into an interest-bearing account. The benefit of the interest shall be to the tenant upon vacating the property at the end of the lease. Maximum – There is no limit on how much an owner/manager may ask for the deposit at the beginning of the term. Returning (Page 9 of the Tenants’ Rights Guide) – Landlord must give the funds back within ‘reasonable’ time and does not specifically say a time period.